Today as I reflect upon the inability of the 112th US Congress to do anything constructive about job creation, I am happy to report that our backyard project is complete. As you may recall, in mid-August we began a very involved and expensive backyard landscaping project which happened in three parts. To sum it up, in Phase One we had trees knocked down and dirt hauled in. 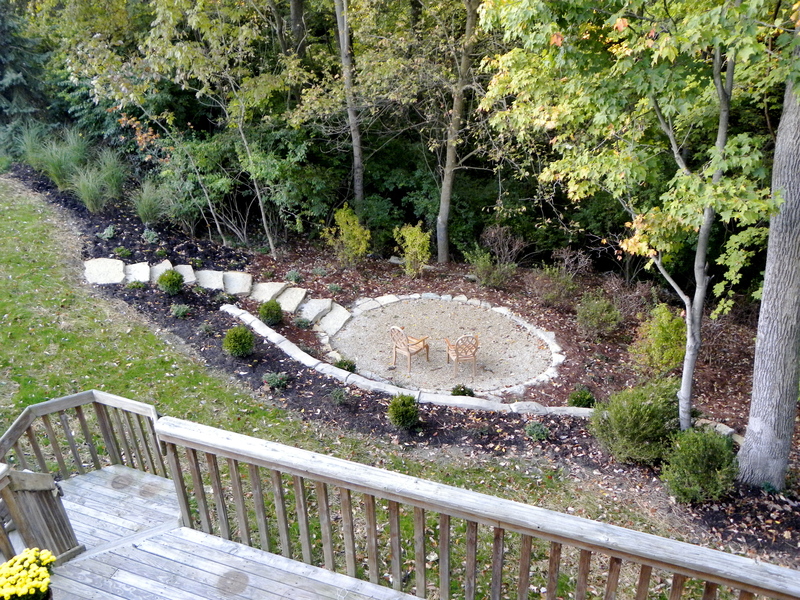 In Phase Two we had a concrete wall built to create two levels in our backyard. And now, here is the rest of the story. Welcome to Phase Three. 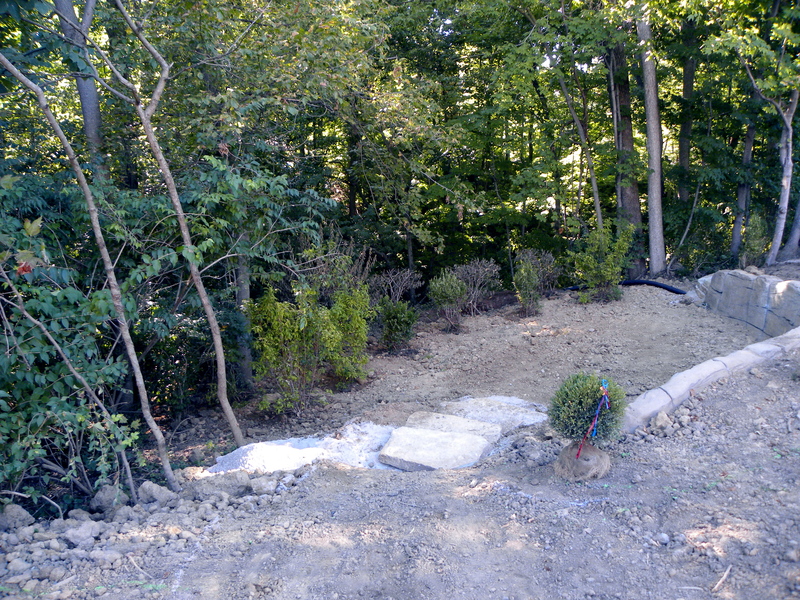 Below is a photo of the stone steps in process. These large steps allow us to get down into our lower level. Without them we’d be slip sliding away every time we went down there. 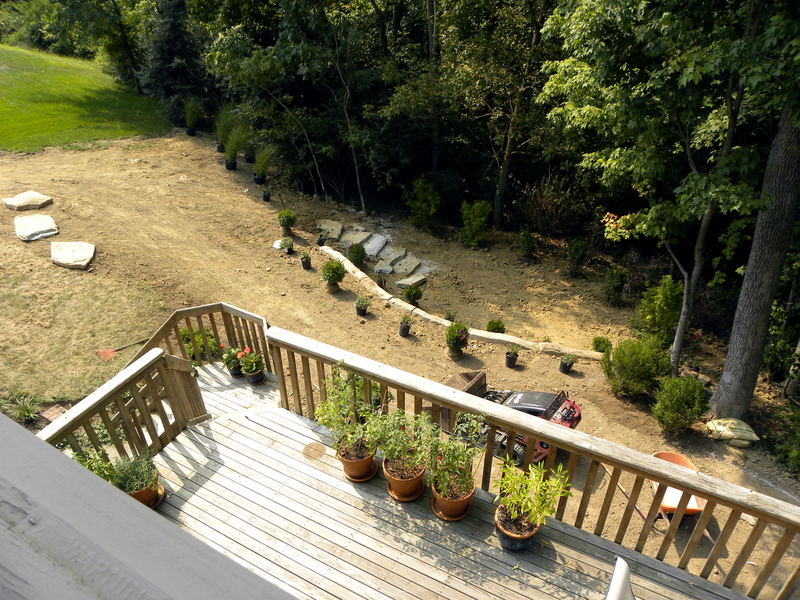 Here’s a photo of our deck and the newly formed backyard taken from the second story of our house. This project was massive. And here is the finished product. The oval that you’re seeing down there is about 12 feet x 9 feet. It is large enough for a full size picnic table or a medium size fire pit with chairs around it. We haven’t decided exactly what we’re going to do with this space yet. One last photo of the side of the house where many of the machines came around to the back of the property. 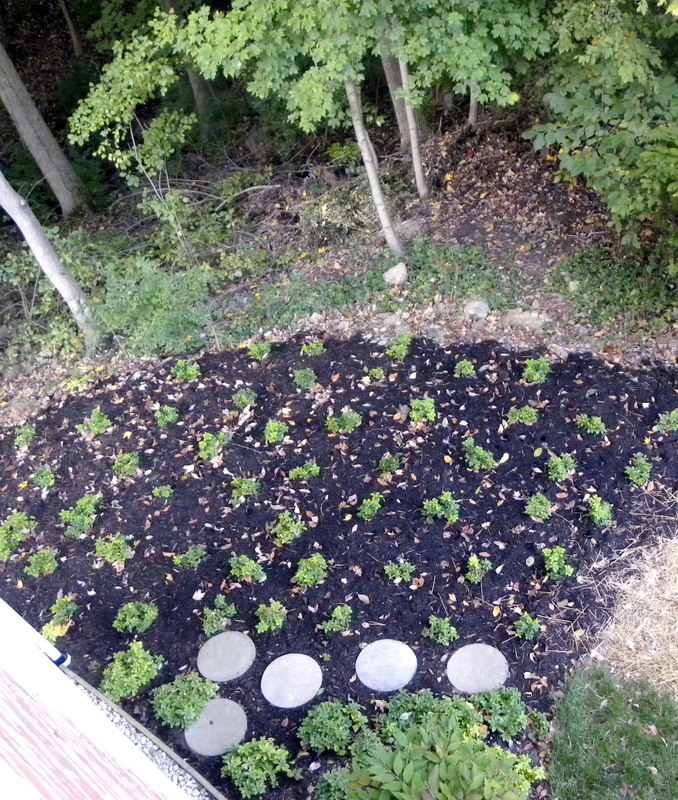 The replanting of Pachysandra looks good and will fill in the area quite nicely. While the results of this project are wonderful, the process was stressful. In total about 30 men worked on this backyard. They showed up [usually without warning] when they felt like working on it, anywhere from 5:30 am to 7:00 pm on any day of the week. Some weeks the weather made it impossible to work back there. Other weeks the landscapers were too busy elsewhere to bother with us. So we waited. And with that, I’m signing off on talking about this project here in my blog. It’s been something good to share with the world, but now it’s time for me to go down into The Spoon and enjoy communing with nature. After all, that was the original reason we did this to begin with. Posted on October 12, 2011 October 13, 2011 Author Ally BeanCategories House & GardenTags Enjoying, Improve Don't Move, In The Garden, Yes! I love the results of your backyard project! As they say, “the good things in life are worth waiting for.” I hope you will get to enjoy this new livable space. We have a little transportable fire container out on the porch of my studio with chairs around it. We love it and have already used it this fall several times to roast hot dogs and marshmallows. Have fun! Beth, I love the idea of roasting hot dogs and marshmallows over a fire down there. Hadn’t thought of that before. Right now I’m just pleased to have this all over with. I understand why people don’t even try to do landscaping things like this. It takes a lot emotionally [and financially] out of a person. Still, we hung in there and now have something fun and different. Which is always good. Congrats and it looks great! I want you to have a BBQ and invite me! Of course, the weather would have to be nice too. 🙂 It looks wonderful. I love it!! Susan and Margaret, thank you both. You’re both invited over for whatever we decide to do with this space! Ooh, I love it! We had a steep hillside at our old house and I always had big dreams for how to landscape it. Time and money kept us from doing much with it. Stephanie, you’re so right. I envisioned this project thinking how relaxing it’d be for us to sit down there among the trees, not realizing how much “difficulty” there’d be getting my idea to fruition. However, it’s all behind us now and I’m going to forget the angst– and focus on enjoy! Hello Mother Nature! There’s a house in our neighborhood that has a bit of land in a former creek, dry for years as the water has been diverted elsewhere…I love looking down into the creek bed they’ve put together, with lights and tables and a tall waiter who happens to be a metal bunny rabbit. Somehow, I wonder if you could find a butler or a waiter for your oval who happens to also be a metal bunny rabbit? J, a metal bunny would be lovely down there! Very whimsical– and memorable. The oval needs something to make it even more special than it already is. But as we’re heading into winter right now, deciding what it’s going to be will have to wait for next spring/summer. Winter will give me time to figure it all out.